If you have kids or grandkids, then you’ve probably seen Frozen. If you have young kids or grandkids, in particular, then you’ve probably seen Frozen no less than 3,281 times. I’ve had a lot of fun experiencing the Frozen phenomena through my seven-year-old daughter. It’s a great movie with terrific characters, songs, and heart! Elsa, Anna, Kristoff, Olaf and Sven have already inspired me to write the 10 Signs You’ve Watched Frozen Too Many Times and 10 Things to Say to Trick-or-Treaters Dressed as Elsa. Now my thoughts turn towards winter, Christmas, and the holiday season. Certainly Elsa and Anna would have favorite Christmas songs they sing year after year. Songs that remind them of their friends, family, and adventures in the lovely kingdom of Arendelle. 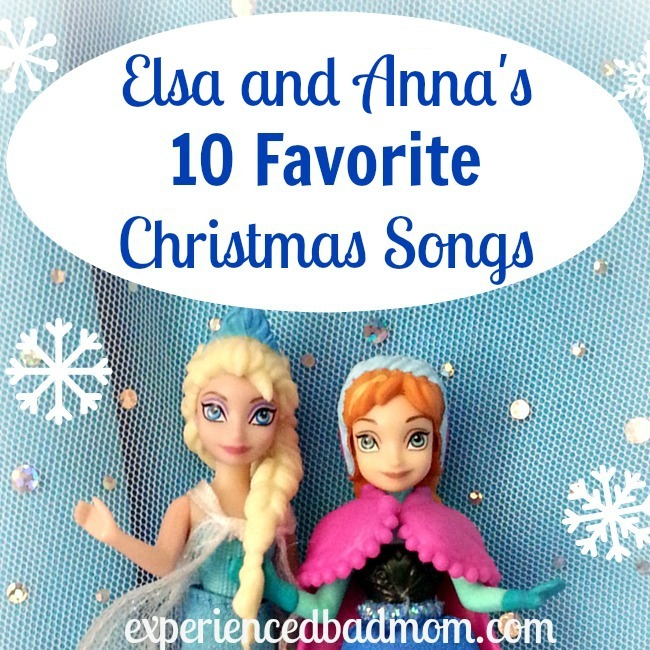 Indeed, I think there are 10 Christmas songs that are PERFECTLY suited to Elsa and Anna. Here’s wishing you and yours a magical, Frozen holiday! What are your favorite Christmas songs? Are there any other favorites you think that Elsa and Anna might have? Note: I am an affiliate for Shutterfly and would receive compensation should you click on the banner or link and make a purchase. Good one, Susan. I could see them jammin’ out to that one, too! He’s never seen the movie. HA! It must be let it snow!! I will admit that one of my most popular posts was a Frozen one as well. I made an Olaf snowball toss game and it got pinned and pinned!! I guess I should learn from that and do another one!! Such a fun post! New follower! Thank you, Elizabeth! I’m now following you, too. Loved your gift post – very meaningful. I’m going to search for that Olaf pin now. He’s such a cutie and it sounds fun. Great list.Thank you for linking up at Bloggers Brags. I’ve pinned your post to Bloggers Brags Pinterest Board. We would love to see you again next monday. I love anything Nat King Cole and Bing Crosby sing during the holidays. I know, right? Although that Idina Menzel album you talked about sounds good, too! My youngest was just outside the threshold for Frozen madness, but she did get in on the act a bit – and sang “Let it Go” in church over the summer. My favorite Christmas song? Probably Jingle Bell Rock, by Hall and Oates. Or anything by Harry Connick. For Elsa and Anna, maybe “Blue Christmas”? *Glad I came here through the Traffic Jam linkup! Ahhh yes, Frozen. My girls love it. Are there any girls who DON’T love it?! Awesome selections and I’m in complete agreement with your list. Time to make a playlist I think! Thanks for sharing (and for linking up to the #CHRISTMASbloghop). Wishing you a lovely evening and a very Merry Christmas!